Center-stage is a series of articles spotlighting a particular model or unit in Godslayer. In this article we will look at the mainstay warlord of the Trolloth – The Duskborn Chieftain. Trolloth feudal lords rely on generals with a lifetime of experience in the noble trade of warfare to advise in the fiefdom’s military affairs. Such militant leaders likely began their ascent to the summit of command as common Ironhide Brutes, and survived dozens of engagements on the way up, cracking countless skulls in the thick of battle. These generals are known as Duskborn Chieftains. The Duskborn Chieftain is the blood-smeared right-hand of his feudal lord; he organizes the defenses, trains the soldiery and leads all forces in the field. Chieftains are respected masters of the warrior-code called the Path of the Crushing Shade, and as such they have access to the Troglodytes sacred Chronicles of War at the temples of their war-god Abraon Wraith-Shade. These codices provide Chieftains a strategic view for commanding war-parties and entire armies. The unrelenting games of war upon the checkerboard of Trolloth fiefdoms create winners and losers, and the Duskborn Chieftains of deposed nobles usually end up bandit-lords or mercenary captains. The religious schism among the Troglodytes for the last five centuries has offered Duskborn Chieftains opportunity aplenty to ply their crimson craft. Like every true Troglodyte, Duskborn Chieftains prefer weapons and armor of heavy iron. Their combination of thick armor and massive burly stature makes them mountains of metal and a daunting challenge to face. They are easily capable of executing entire enemy units with brutal efficiency as they stride ominously across fields of gore. MAG 4 – Low, reflecting their mental weakness. The Chieftain is a regular infantry warlord, so not a particularly fast model, but he has pretty good melee skill and good resilience. Regeneration – At the end of his activations he regains D3 life-points. This is immensely useful for such a model since he has a starting total of21 LPs! Together with his high Armour of 9, plus armor equipment items and talismans, the Duskborn Chieftain can be a really tough warlord to take down. In fact, I would say apart from the Runegate Keeper, he is the toughest warlord in wave-one, surpassing even the Centurion in resilience. This makes him a really great warlord to use as a melee killer. And when you see how offensive he can be, then that option makes lots of sense. Fear – When you engage a model/unit or they engage you, they will need to make a Fear test (unless immune to fear). If they fail, then they suffer -2 MEL. Use this advantage to pick on regular troops who ARE affected by fear, such as Bladeslingers, Scabhta Hunters, Legionnaires, Xisteri Bombers, Hoplites, Amazon Hunters, Toughborns, Kinswords and Fjell Warriors. Savage Pride – +1 to attack and damage rolls against models with equal or bigger base. This makes him a good creature, cavalry and monster (such as ogres, guthackers etc.) hunter. Trolloth Commander – +2 for orders to Trolloth models. Okay, nothing special, but sometimes useful when the unit leader is dead. Carnage – Here is the crunch. This amazingly powerful tactic can give entire units Slay-Movement. Well that’s not much use to Gnolls or Grayhorns (who are unlikely to kill any enemy with their charge attacks), but for Ironhide Brutes who have POW5 and MEL6 on the charge, this can be a slaughterfest. Best used when they are about to charge standard units, (not elite models with high ARM and lots of LPs). Rage – Gives a unit +1 to hit. Nothing amazing; but exceedingly useful throughout most of the game. Slam Back – This tactic is another unit tactic, enabling your troops to knock enemies out of melee range when they successfully hit them (in addition to any damage they do). Because your Brutes, Grayhorns and Longshadows will often find themselves outnumbered, this can be extremely useful for reducing the number of enemies they are facing. Remember the Warlord can also use this himself if he gets surrounded. So what initially looks like a brutal melee guy actually turns out to be versatile enough to be used as a strategic buffer warlord. In fact, the three unit tactics he has, together with the action tokens he can give out can keep your warlord busy the entire battle so that he never even gets into melee. This is a really viable option! It really depends on your taste and your mood. He has 3 options, of which the first two have the ambidextrous attack option, allowing 2 attacks for 3 action tokens. This means that in a straight fight, he can make 4 attacks per turn with some pretty powerful weapons. Additionally, they all ignore shield bonuses! This is truly awesome when facing a warlord like the Demarchon or Centurion, because he effectively gains a +3 stat advantage in POW/MEL. Against Hoplites, Legionnaires, Fjell Warriors, Kinswords, and Valkyrie he has a nice advantage since they also carry shields. This is the basic weapon and has POW5. For 3 points more you get the same as above but with critical knockdown. Instead of Ambidextrous attacks, you get a Thrash attack, targeting every model within 1 inch at POW3. Against light infantry, this makes him a real lawn-mower. When combined with Slay Movement, it looks like a splatter movie; he charges 3 models, and attacks all three. If he kills one, then he gets a free movement, then another thrash attack for free. Then with 3 ACT left over, he can make another Thrash attack. He can potentially wipe out an entire unit of light infantry or low-arm troops like Mongrels. Even Hoplites become mince-meat since he also ignores their shield bonus of +2 DEF and +1 ARM. Same for Fjell Warriors. I think it is always worth the 11 points for this weapon if you plan to use him as a melee warlord. Blackfire Helm – gives +1 DEF, which is very useful considering his low (for a warlord) DEF of 13. Cloak of the outer Dark – means attacks from enchanted weapons (all warlords and some other models roll 3D6 for damage and remove the highest die. This can generally reduce the average damage by 1-2 points. Thick Hide – gives +1 ARM. Considering his ARM of 9, it is really worth taking because with an ARM of 10, most models will cause zero damage on an average damage roll of POW3 + 7. Dragonscale Armor – gives +2 ARM but makes him Heavy Infantry. Hmmm…I really like the +2 ARM and moving 3 times per round is probably fine for most of the game. So actually a pretty damn awesome weapon unless you are planning for a fast, zippy warband, in which case, your warlord will be left behind. ARM 11 is just awesome; even many warlords will struggle to damage him (Demarchon, Centurion, Pendragon, Godquester, Technocrat, Farfarer, Shaman). He really only needs to watch out for Nordgaard warlords. Styganite Crystal – basically a 3-inch AOE shadow grenade with POW2. A nice little gimmick against low-ARM troops, but there are more important items for this warlord. Mask of Dusk – Makes him immune to MIS, MAG and Spell attacks. Wow. That means he can only be damaged in melee, and as we already know, our man the Duskborn Chieftain is a mean monster of a warlord in melee. When facing Mortans, Halodynes or Wyldfolk, always take this item! Sacrificial Shade – Once per game, you can halve one damage roll. A nice defensive Talisman. Iron Crown – Shadow Troll models within Lead range benefit from their sub-faction ability. Clearly this is meant for the Duskborn Chieftain or Grondah Filthling. Pretty useful if you plan to take a few Shadow Trolls in your warband; if not, then it’s a heavy head ornament. Various models in the Troglodytes Warband have useful synergies with the Duskborn Chieftain, either assisting him or ideally suited for being buffed by the warlord. Feral Hammerfist – By the very nature of his job (knocking down lots of enemy models), the Hammerfist is often engaged by many enemies. If his Rumble tactic goes wrong, he can find himself surrounded not by knocked-down enemies, rather by lots of angry enemies ready to attack him. For such a case, it is a nice insurance policy to order the tactic Slam Back on your Hammerfist, and then with his remaining 1-2 ACT, he can knock a couple of enemy models out of MEL range. That could let him live an extra round. This is especially useful when the Hammerfist will attempt Rumble on high-ARM models. Ironhide Brutes – Firstly, the Chieftain allows the Ironhide Brutes to benefit from their awesome regeneration sub-faction ability. Not only that, the Chieftain has three different tactics he can order to the Brutes – Slam Back, Rage and Carnage. Remember that the Brutes also gain +2 on LEAD-rolls for receiving ordered tactics from the Chieftain because of his ability Trolloth Commander. The tactic Slam Back is best used when the Brutes are already engaged or about to be engaged/charged, not when they are charging. Carnage is perfect for charging with Brutes, and is one of the most powerful offensive tactics in the game! (giving the unit Slay-Movement). Rage is useful any time when the other two tactics don’t make sense. Lighteater – The Eclipse tactic of the Lighteater allows you to place a 5AOE template haze effect, which blocks line of sight (preventing shooting and charging). Reaver Runts – Funny as it might sound, Reaver Runts can act as a great bodyguard for your Chieftain. Think of them as disposable slaves. A minimum unit of 6 (33 points) can provide a living shield, preventing enemy models charging your warlord. This has the added benefit that you do not need to keep your warlord hidden behind your Ironhide Brutes, and you can instead use him more independently. Because of the Reaver Runts’ Squishy ability, your Warlord can charge over them into the enemy! 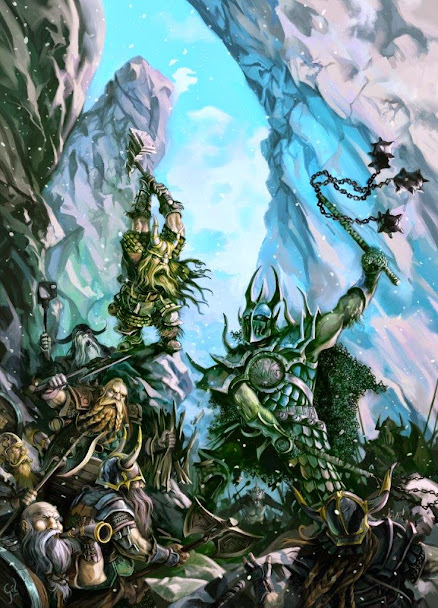 Fleshpounder and Grayhorns – they share the same sub-faction ability, so worth considering for your warband. Grahorns are great against LOW-ARM hordes, and Fleshpounders excel against high-ARM elites. This is for those times when you want to inflict horrendous carnage with a single high-points model. You will need your Chieftain equipped with “Melee Killer warlord outfit” version C; and you will need 6 Reaver Runts. While using your main warband to keep the opponent busy, maneuver your warlord into a position so that he can charge enemy units. The Gnolls will act as a shield preventing your warlord being engaged. Position them in two layers to prevent and enemy killing one and then moving through. Assuming an enemy unit takes the bait and charges the Gnolls, wait for them to use up all their action tokens. Then in your activation, charge over the Gnolls (due to their Squish ability) into the enemy unit, engaging as many models as possible. Use your “thrash” attack of the Chainwhips so that you attack hopefully 3-4 models in melee range. With your charge bonus, you will have MEL9 and POW4. Assuming you kill at least one enemy model, you can now make a free Slay Movement and position yourself in the middle of the enemy unit, then make a free thrash attack. Then use your last 3 ACT to make another Thrash attack. If anything is left standing, it will be a miracle. Rmeember, all your attacks ignore shield bonuses. With this outfit, the enemy can only kill your warlord in melee. Your Reaver Runt bodyguard should last for one round. After this you are on your own, but by then the ranks should be thinner and many enemy will be engaged with the rest of your warband. Remember, that your warlord causes Fear, and when enemies fail the Fear test, they suffer -2 MEL! If you find yourself surrounded by many dangerous enemies, use the Slam Back tactic on yourself and make a Thrash attack. In addition to any damage you do, every enemy you hit can then be moved 3 inches away. That means every model in 1-inch has a good chance of suffering Slam Back. This even works when counter attacking (assuming you already activated the tactic). You will need your Chieftain with “Strategic Buffer” outfit, a unit of Brutes and 1-2 Lighteaters. Move your warband forward and use the Lighteater/s to go ahead and engage the enemy. Bring up your Ironhide Brutes and get them into charge range. In case your Ironhide Brutes unit may be charged, use the Lighteater’s Eclipse tactic to place a haze effect to prevent this (by blocking line of sight for the enemy). In the next round while the enemy units are engaged by the Lighteater/s, activate your Duskborn Chieftain and order Carnage to the Ironhide Brutes. When the Lighteater is activated, the Eclipse haze effect will be removed, and you can replace it in a more advantageous place, allowing your Brutes to charge the enemy. Then activate your Brutes and charge them at the enemy. With Carnage the Brutes gain Slay Movement which means D3 inches free movement plus an extra free attack (with the charge bonus). Your unit of 5 Brutes will be making potentially 15 attacks during the round – all with charge bonus! Your Brutes might even be able to repeat the strategy in the following round, but in case they are still stuck in melee, use the Lighteaters and Chieftain to kill the enemies engaging them, thereby freeing up the Brutes for new charges. Equip your Chieftain with the “Monster Hunter outfit” and a small bodyguard of Gnolls. Deploy him so that he is in the best position to go after the opponent’s creatures. Head straight for them and left the rest of your warband concentrate on the bulk of the opposing forces. Don’t worry about getting the charge, just try to get your warlord into charge range of a meaty creature. Quite often they will have a longer charge range than your Chieftain Your Gnolls should be able to protect you if you line them up in two lines of three between you and the creature. Even creatures with 1 ACT attacks will need to kill at least 3 Gnolls and move twice in order to engage your warlord. Remember that Savage pride gives you +1 to hit and damage rolls against models on bigger or equal sized bases, so that’s basically every Creature in the game. In most cases (if you use your Gnoll shield) you should also get the charge, so you will be at +2/+2, so MEL 10 and POW7 X4 attacks. For smaller creatures like the Bloodvarg and Cerberos, that should be enough to butcher it in one turn. Against the Cyclops, Fjellgangr and Fleshpounders he will need two turns on average. In that case, use your Gnolls to block charges against your Warlord’s flank, but do not use the Gnolls to engage the enemy Creature or they will be ripped apart. The above Monster-Hunter plan works even better with cavalry! Equip the Chieftain with Melee Killer warlord outfit B or C and a Gnoll Bodyguard. Go hunting for the enemy cavalry unit / Model and give your Gnolls an action token so that they can move 5 times. They should then be able to pin the enemy by engaging them due to their 15 inch movement and 1 inch melee range. Try to cluster them around -2 enemy cavalry models so that they cannot easily break free of your Gnolls and are discouraged from risking the free-strikes from disengaging. Next turn your Warlord should be able to catch up with them and then charge (through the Gnolls if necessary). Try to get into melee range with at least 3 cavalry models, then use your Chainwhips “thrash” attack together with your charge bonus and your Savage Pride bonus. With your chainwhips you will be making an attack against every enemy in melee range. Hopefully you can kill one enemy with one of these charge attacks. In that case, you make your slay movement and another free attack against all enemy models in range. Follow that with a third chainwhips attack, and you have very likely made 9 attacks at MEL 10 and POW5. That is enough to execute a unit of Amazon Hunters. You will need 6 Skullsmasher Oakbows, 12 Reaver Runts, 5 Ironhide Brutes and a Hammerfist. Equip your warlord with “Melee Killer Warlord Outfit” A or B. You would be surprised how much damage two units of Skullsmasher Oakbows can do. Within 12 inches, they have a POW of 5, and even at long-range they have a POW of 4. With a MIS of 6 from Bracebow ability, their firepower can be enough to draw the enemy to you (unless they are even more shooty – like Wyldfolk). In this case you can prepare a nice ambush. The Oakbows should be in a nice vantage points on a hill or at least off to the sides, and well back. Place the Gnolls in the front-middle as a living shield to absorb charges from the enemy. Place your Brutes behind. Use your Chieftain to give your Brutes the Carnage tactic, and use the Hammerfist to knockdown the elite unit models. Then charge with your Ironhide Brutes. • Remember he has sight-Value 2 with his medium base, so he can see over small-base models for line of sight. It also means he can be shot at when behind small-base models. IF you use Gnolls as a bodyguard, remember they have the tactic Swarming Pack, which gives them sigh-Value-2 and therefore can block line of sight to your warlord. • Although incredibly resilient and possessing the cool Slam Back tactic, the Chieftain can be cut down when charged by a unit of elites such as Skulleaters, Einherjer, Hill Ogres, Guthackers, Sons of War, Carnifexors, Cromlech Guard etc. In this case, you won’t have any need to use Slam Back because he will be dead from the charge attacks of 3-4 elites. So keep him out of the way of such units, or keep your Reaver Runts bodyguard handy. • Read the Scrolls of Victory article part 1. This is extremely relevant to the Chieftain and any Trolloth warband. • You effectively have a free healing spell being cast on your warlord every turn, but he should pick his battles. When he gets down to half life-points, it makes sense to get him out of melee for a round or two so that he can regain a few life-points. Remember that with all of his equipment, he will probably be worth around 80 points, so you definitely do not want to hand those points to the enemy. While he is resting from fighting in melee, he can still be useful, buffing your units and individual models. • Keep in mind that due to his many attacks and average POW of 3-6, he is ideally suited for taking on standard units with low-medium ARM. Against them he excels! Against high-ARM models (who do not have shields) like Einherjer, Carnifexors, Cromlech Guard and Skulleaters, he will struggle; and especially so against heavily armored warlords like the Runegate Keeper and Centurion. 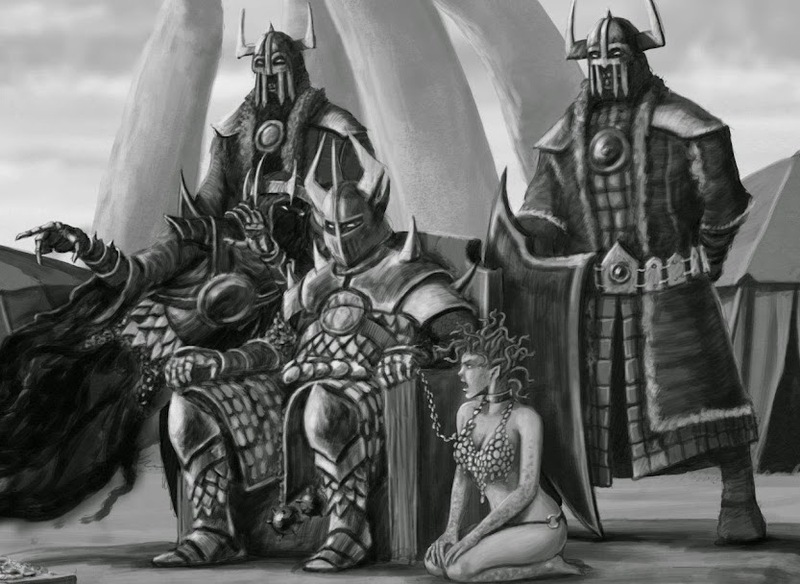 The Trolloth Sub-faction was always intended to be a brutal melee sub-faction with decent armor, powerful attacks and lots of life-points. We imagined the Trolloth as excessively violent in battle, hell-bent on smashing the enemy to death with pure force rather than finesse. So the warlord for the faction needed to embody and personify this image, and I think he does that. By the time we came to making the cards for the Trolloth based on the original concept notes, we already had Halodynes and Nordgaard finished and play-tested for 6 months, so we could create them with more accuracy and they would require less changes. 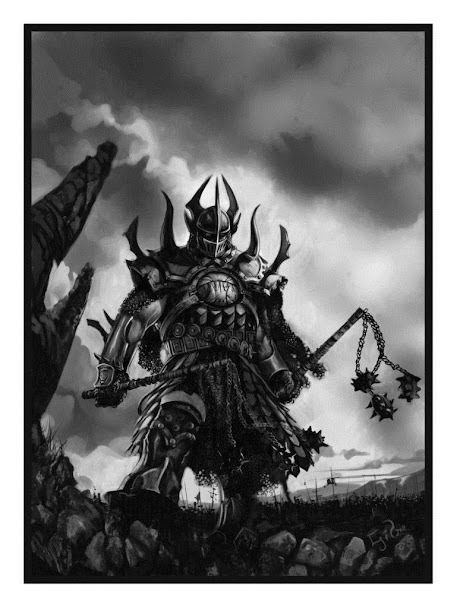 The first incarnation had the abilities Trolloth Commander, Savage Pride, and Fear, and two tactics called Overrun and Slam. Slam was first envisioned to be used in an offensive capability when charging, but we quickly saw this was far more useful for defensive fighting. Overrun was Slay Movement and +1/+1 to hit and damage. That was before the charge bonus rule and fighting styles had been fully nailed down, and so with the creation of the charge bonus, Overrun became the Carnage we have today. He originally had 18 life-points and cost only 45 points and had access to potions. Although intended to be a pure melee sub-faction, during play-testing we found the Chieftain a little too simple so we added a simple melee tactic Rage. After one year of play-testing his points had been increased to a more realistic 51. During play-testing the Chieftain went up against many other warlords, and over time we came to see what a true monster this guy was. For that reason we made his equipment 1 armor item OR 1 talisman and stripped down some of the items he had access too because with some combos he was nearly un-killable. After lots of complaints from Trog testers, that idea was dropped, and we instead removed the potion option. Life-points were increased for all warlords during the second year of play-testing, and so the Chieftain got 21 points. Towards the end of play-testing we seriously reviewed the points of every model and the Chieftain was increased from 51 to 54. Interestingly, his basic stats never changed throughout the 4 years of play-testing. The Chieftain can be used as a melee killer warlord, or as a buffer warlord for buffing your units, or in a dual role. In either case, his strategic use is not subtle, and was never intended to be. And we would never want it any other way. It was our intention to make the factions and sub-factions in the game varied, and there are plenty of other sub-factions which work with model synergies and advanced strategies of interaction (like Wyldfolk) or stacking buffs (like Banebrood and Magistratum). So a less complex, melee sub-faction is really something unique in Godslayer, and offers plenty of fun. The chieftain like other models of the sub-faction must be used cleverly because the models do have high points costs and will often be faced with superior numbers, so despite their powerful and resilient style, they are not particularly easy to win with. That said, the Chieftain is still one of the top 5 most powerful melee warlords in the game. In some ways he has similarities to the Banebrood’s Gorelord, but the Gorelord has less leadership and far less armor, while possessing more DEF and much greater speed. So though closely matched due to their size and ambidextrous weapons, the Gorelord is a super-offensive warlord and the Duskborn Chieftain is far more defensive with his great armor, regeneration and Slam Back tactic.